The old gods are dead, she told herself, with Mother and Father and Robb and Bran and Rickon, all dead. The world of Westeros has been defined and shaped by religion. For much of the south, the faith of the Seven is professed-but in the north, the Old Gods still hold sway. The ironborn worship the Drowned God, and the fires of R'hllor are spreading from Essos across the Narrow Sea. Whether held devoutly or used as a pretense for power, these religions have a profound effect on the game of thrones and those who play it. In Favor of the Old Gods, you'll find the continuation of the Flight of Crows cycle for A Game of Thrones: The Card Game-drawing players deeper into the events of A Feast for Crows with cards that feature the bestow keyword or reward you for forging alliances between factions. 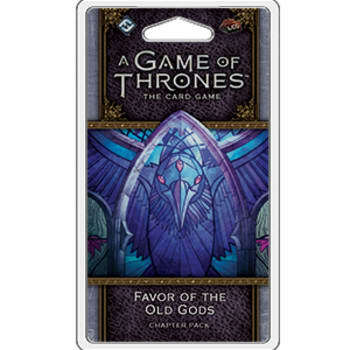 This pack also features an assortment of cards with traits such as Old Gods, The Seven, or R'hllor, hearkening to the many religions that have played their roles in the tumultuous game of thrones. From a new agenda evoking the mystical powers of the greenseers to characters like Selyse Baratheon and Ser Balon Swann, this Chapter Pack has plenty to offer for every faction.